How do I file a license application? What happens after I file it? How do I obtain an “Advisory Opinion” on export licensing questions? What is an ECCN; how do I find one for my commodity? Can I export my product? Can I export my product to a particular country or person? Can I export endangered or protected species? 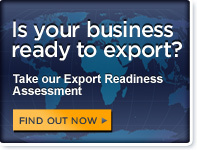 Where do I find more information about a Shipper’s Export Declaration? Does my product need a European CE Marking? Does my product need a China Compulsory Certification (CCC Mark)? How can I find out more information about packaging and recycling regulations?